This week’s post is a closer look at seed expense and the implication of higher yields. Our recent post reviewing trends in corn and soybean seed expense received a lot of attention. A few readers reached out with questions and comments about the data, how it was presented, and potential implications. In answering their questions, we made a few additional observations worth sharing. This week’s post is a closer look at seed expense and the implication of higher yields. While the earlier post presented data mostly in terms of expense per acre, we were asked about seed expense per bushel. The reason for considering the data in these terms is even though seed expense per acres increased, more bushels per acre have been raised. How has seed expense per bushel been impacted? This is a good question. Corn (figure 1) and soybean (figure 2) seed expense is shown on a per bushel basis since 1975. Again, these are the USDA’s reported data. For a point of clarification, these are nominal (or reported) expenses divided by the trend yield for the given year. The trend yield was used – rather than reported yields- to avoid large swings from year to year due to yield variations. In a sense, using the annual trend yield is similar to using a budgeted yield. In both cases, a dramatic increase in seed expense per bushel was observed. For corn, seed expense slowly increased through the early 2000s. While the expense previously remained less than $0.25 per bushel, it quickly exceeded $0.50 per bushel before reaching a high of $0.62 per bushel. In 2017, the expense reached $0.59 cents per bushel. Throughout the 1980s and 1990s, soybean seed expenses were typically $0.40 per bushel. This jumped to a high of $1.37 per bushel in 2010. Since then, the expense has fallen to $1.26 per bushel in 2017. Figure 1. U.S. Corn Seed Expense, dollar per bushel (trend yield), 1975 to 2017. Data Source: USDA NASS. Figure 2. U.S. Soybean Seed Expense, dollar per bushel (trend yield), 1975 to 2017. Data Source: USDA NASS. For those interested in the Purdue crop budget data, corn seed expense per bushel is available here, and the soybean seed expense per bushel is available here. As a matter of preference, I find evaluating seed expense as a share of budgeted revenue most insightful (Figure 3 and 4 from the earlier post). By considering seed’s share (slice) or total revenue (the total pie), meaningful conclusions can be made as revenues change over time. While our earlier post attempted to account for changes in the cost structure, we thought it would be helpful to consider higher yield – and revenue – expectations. For this, we specifically considered how much yields have increased, how much seed expense has increased, and what share of additional revenue did changes in seed expense consume. Table 1 shows the data for changes in yields (revenue) and seed expense. The first column compares the averages for 1975-1979 with the most recent five years (2013-2017). Again, the idea is how much gains occurred, and what share of the gains was consumed by higher seed expense. For the purposes of this post, we assumed each additional bushel of corn was worth $3.70 per bushel. Obviously this is a debatable point, but we’ll use this as a starter. Since the late 1970s, increases in the national trend yield have been 71 bushels per acre. At $3.70 per bushel this is a value of $261 per acre. Over the same time frame, seed expense has increased $89 per acre. Or, in other words, higher seed expense accounted for 34% of the gains from higher yields. The second column shows the same data but compares the average of 2000-2004 versus 2013-2017. During this time, trend yields increased 24 bushels per acre, or a value of $89 per acre. The change in seed costs during this time was $67 per acre. Over the last two decades, changes in corn seed expense have accounted for roughly 75% of the gains from higher yields. Table 1. Changes in Corn Yields and Corn Seed Expense. Table 2 shows the same data, but for soybeans. Considering changes since the late 1970s, trend yields have increased by 16 bushels per acre. Assuming a soybean price of $9.90 (yes, this is high, but is consistent with prices observed in recent years), the value of those yield gains were $161 per acre. Seed expense over this time changed by $50 per acre, or 31% of the yield gains. Recently, soybean yield gains have been $55 per acre, while changes in seed expense were $34 per acre. Similar to corn, recent changes in soybean seed expense have accounted for a larger share of yield gains. Since the early 2000’s, 61% of yield gains have been offset by higher seed expense. If you assumed the value of those additional soybeans was less, say $8.50 per bushel, the share would be even higher. Table 2. Changes in Soybean Yields and Soybean Seed Expense. 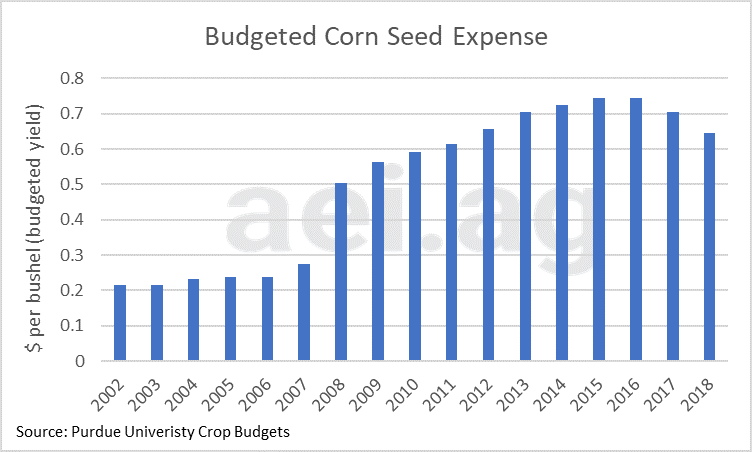 This week’s post is another look at how seed expense has changed over the last two decades. Specifically, seed expense accounts for an increased share of total expenses of total production expenses (figures 1 and 2 from last week’s post), or budgeted revenue (figures 3 and 4 from last week). This week’s post considers increasing seed expense relative to trend yield gain. 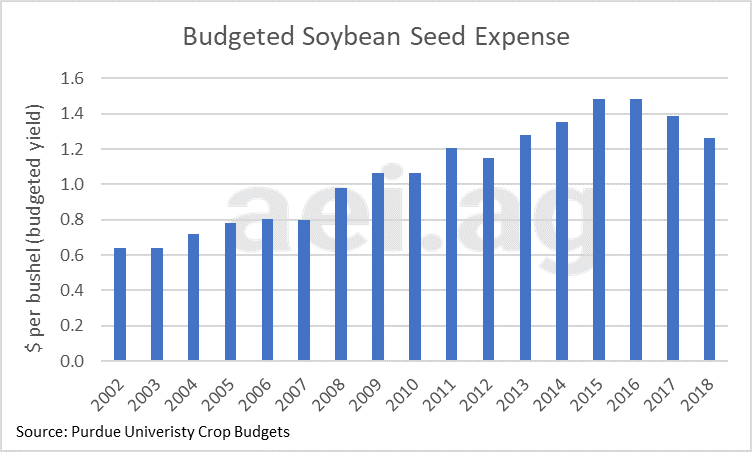 It is not surprising the the overall share of seed expenses increased as there has been considerable substitution created via traits added to seed. These traits have resulted in some chemical and pesticide expenses being avoided and added to seed costs. The magnitude of this substitution is open for debate. We will look at some of the trends in chemical expenses in a later post. In light of the Margin Squeeze and tough crop budget outlook, many of our posts have focused on costs of production trends. You can read more about fertilizer (most recently here), family living, cash rental rates, and machinery, to link to a few. Figure 3. Percentage of Total Expense for a 50/50 Corn-Soybean Rotation, Average from 1991 to 2017. In our presentations at farmer meetings, the chart we share the most is figure 3. This shows the allocation of total expense for a 50/50 corn-soybean rotation in Indiana. In our opinion, a lot of attention and focus goes into fertilizer, seed, and pesticides expense. This group, however, only account for 26% of total production costs. For operators serious about managing their costs and, when necessary, making adjustment lower, they must focus on all slices of the pie. Perhaps the most variability in expenses among producers is land and machinery expense (Brent previously wrote about this machinery variation). We’ll continue with cost trends in an upcoming post that considers chemical expenses. Finally, we’ll reiterate a point on seed. These data, seed expenses, are a function of prices paid, the traits purchased, and the seeding rate. Producers will need to consider all factors when making decisions for 2019. Interested in learning more? Reach out to learn more about AEI’s Crop Budget Outlook Project, which helps agribusinesses and ag lender plan for 2019. Also, follow AEI’s Weekly Insights by clicking here. Also, follow AEI on Twitter and Facebook. Photo Source: Flickr/United Soybean Board.